NPR’s Weekend Edition Sunday did a piece the other day on the lack of diversity in the characters in children’s books. You can listen to it here. 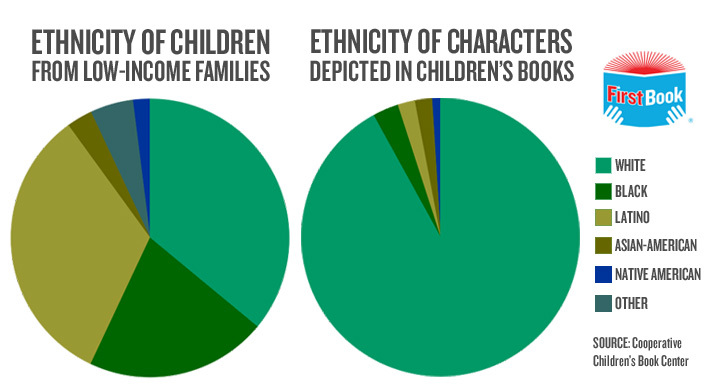 Apparently only 1.3% of the characters in today’s kids’ books are African American. We have obviously come a long way from my childhood when unrepentantly racist characters abounded in the colonial-era books then current in Britain. I recall in particular Epaminondas (“You ain’t got the sense you was born with”) and Little Black Sambo. We are no doubt better off without these folks (though I’m slightly surprised to find them both featured at Amazon) — but it seems we omitted the other part of the correction, having failed to replace these caricatures with other, better role-models. First Book seems to be determined to do something about it, pledging to buy 10,000 copies of books by and about underrepresented groups. That’s a really interesting stat! That’s a really good point — non-white races really are under-represented in children’s books, aren’t they? Even in Harry Potter, all the main characters are Caucasian, I believe.